In a previous article, I looked at nonverbal signage and wayfinding outdoors. Today’s article looks at the same topic, but focusing on indoors wayfinding. I’ll begin this article with a discussion of a signage issue that’s a significant problem in most hospitals. I’ll then move on to look at different wayfinding strategies that people use, and at some ways of working with those strategies in indoors wayfinding and signage. A standard feature of hospital signage is the Wall of Doubt. Here’s how it works. The visitor (the red oval marked “V” in the diagram below) has entered the hospital via the main entrance, en route to an appointment in the Wilson Ward, and is walking along the corridor in the direction indicated by the red arrow. So far, so good. Now the visitor meets a T junction, and sees something that for many visitors looks something like this: the dreaded Wall of Doubt. Which of these signs, if any, might be the one for Wilson Ward? At this point, things start to go steadily but unnecessarily downhill. Why? That’s the topic of this article. About 10% of the population have serious reading difficulties; many people have visual difficulties. That’s why I’ve used a font in the image above that will be unfamiliar to most readers, to give an impression of what the signage looks like to people with those difficulties. When they encounter a wall full of signage, they will probably need time to read through the signs and work out which direction they need to go in. So they have to stop in front of the signage and read it. The more places a junction connects, the more traffic it will have, and the more signs there are likely to be. The more signs there are, the longer it will take a visitor to read them, and the longer the visitor spends reading, the more of an obstruction the visitor becomes. The amount of space the visitor takes up is more than just their physical size; each passer-by needs to allow some spare space in case the reading visitor suddenly starts to move again. The result is a disturbance zone, marked “DZ” on the diagram below. It’s a lot of space, even for just one person. If you’ve got more than one person – for instance, a carer with a patient in a wheelchair, or other visitors waiting for their turn to read the signs – then they become a major obstruction, which isn’t much fun for anyone involved, including them. So, within seconds of entering the building, many visitors are likely to be flustered and stressed as a result of the signage. It’s not a great start. There’s also a sporting chance that the wording on the signs isn’t the same as the wording on the appointment letter, or the wording used by the receptionist; for instance, “Wilson Ward” might be a new name for a ward that’s been signposted using the old name, or it might be an informal name among the staff. At the T junction, the visitor doesn’t actually need to know the names of all the possible destinations. All the visitor needs to know is whether to turn left or right. Simply telling visitors to turn left or to turn right isn’t as helpful as you might think, because a surprisingly high proportion of people can’t reliably tell left from right, and because a lot of people will forget whether the directions said “left” or “right”. A better strategy is to give visitors directions that are easier to remember. Here’s one simple way of doing this. The verbal signage is still there, but it’s supplemented by a symbol on each side. On the left, there’s a green hummingbird; on the right, there’s a red flower. Now, you can tell a visitor to go in the direction of the hummingbird or the direction of the flower. This strategy means that any visitors who have reading difficulties but who don’t have visual problems will be able to make the correct choice swiftly and easily at the T junction; so will visitors who have trouble telling left from right. A fair proportion of the visitors with visual problems will also be able to make the right choice, depending on the nature of their visual problems, and the visibility of the two symbols. It’s not a perfect solution, but it’s a reasonable start. There’s another way of tackling this particular problem, but it doesn’t seem to be part of standard architectural craft skills yet. If you know that a particular T junction is going to be a major intersection where visitors will regularly be forced to stop and read signage, then you can design that junction so that it has room for regular users to fast-track past them, like this. Using angled edges to the junction in this way gives a clear route for regular users who know where they’re going, and thereby improves the traffic flow. Again, it’s not a perfect or complete solution by itself, but it helps with one part of the bigger problem. Which takes us back to the bigger picture of wayfinding and signage. I’ll discuss the first three of those strategies; I won’t discuss maps, because those are very different from the first three, and are a substantial topic in their own right. Both outdoor and indoor wayfinding aids can be complemented via the design of appointment letters and of online information, which I’ll discuss in a future article. One common issue in indoor wayfinding is keeping track of which floor you’re on, since usually they look much the same. One solution is to vary some aspect of the décor systematically from the lowest floor to the top floor. The colour of paint on the walls is one way of doing this. 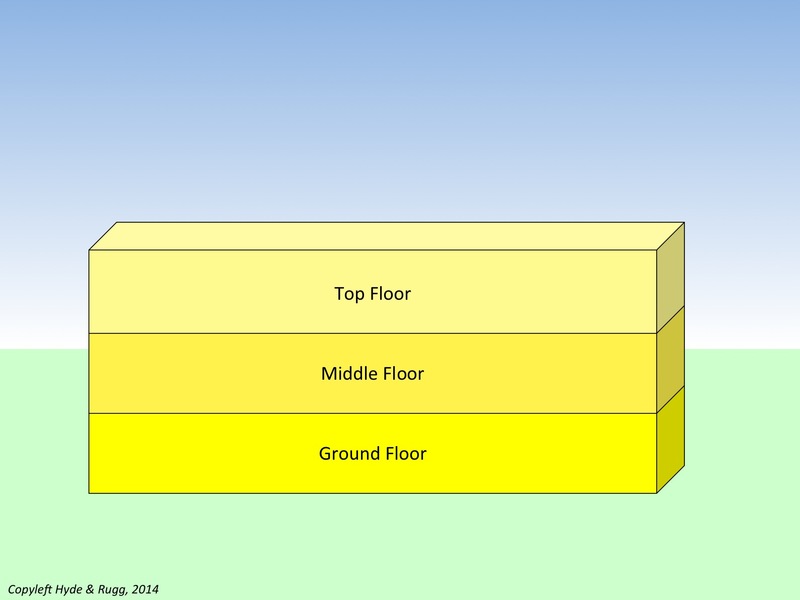 In the schematic diagram below, the ground floor has the most intense colour, the middle floor is intermediate in intensity, and the top floor has the least intense colour. The same principle of systematic variation can also be used horizontally across an entire level of a building, to help visitors know roughly where they are within that level. A key point is that the variation has to be systematic – for instance, corresponding to the distance from the main doors. This is very different from using a particular theme for an area, but not having any organising principles within that theme. There are plenty of other potential wayfinding cues that can be used in this way, such as plants, subject to the usual health and safety issues. Staff will probably have useful ideas about this; it’s a particularly good way of giving people some control over their working environment, and of making it more attractive for them. Watch out for phobia triggers – for instance, quite a few people have cat phobia, and won’t thank you for multiple pictures of kittens on the walls. A lot of people are colour blind, so if you’re using colour as a wayfinding cue, it’s a good idea to co-vary the shade with the colour. The cues need to be visible from a wheelchair if possible. The cues need to be visible from as far away as possible. 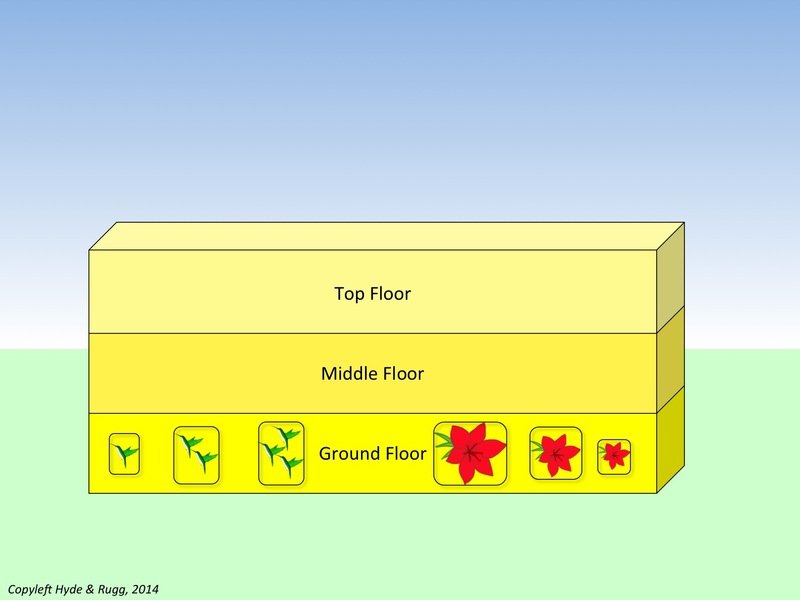 The principles for indoor landmarks are similar, but not identical, to those for outdoor landmarks. The interiors of large buildings tend to be short of deliberate landmarks (as distinct from verbal signage). As a result, people often use “corridor furniture” (e.g. vending machines), architectural features, and decorations on the walls as landmarks. It’s often possible to turn these accidental landmarks into deliberate landmarks. Where I work, for instance, we’ve deliberately had one door painted a distinctive red, and installed a large picture of daffodils in woodland, as deliberate landmarks (“You go through the red door just outside, and follow the corridor till you come to the stairs with the picture of the yellow flowers halfway up”). The reason that this works is that we’ve taken account of some key principles of landmark design, described below. It’s worth thinking creatively about the ways that staff customise their workplaces, in relation to this issue. Receptionists often like to have features such as plants or decorative objects where they work; it usually wouldn’t cost much to liaise with those staff and to choose a striking customised feature for key points such as reception areas, that can serve both as a landmark and as a decoration. This issue is important when giving directions to visitors. If there are several large abstract paintings in the building, then it will be difficult to tell a visitor exactly which of those paintings is the landmark that they need to use. In the case of our daffodil picture, however, there’s only one picture of daffodils on a wall in the building, and it’s very easy to describe to visitors. Here are a couple of ways of tackling some of these problems that aren’t as widely used as they should be. One solution is to make sure that there are landmarks visible from each decision point (e.g. junctions in corridors) so you can tell the visitor which landmark to go towards, as opposed to telling the visitor to turn left or right (which is hard for everyone to keep track of in a long list of directions. Another solution is to use landmarks which point in commonly used directions (as in the case of the hummingbird picture, which points in the direction of the wards for which it is a landmark). It’s often possible to use an image to tell visitors that they’ve arrived at their destination. Sometimes this can be done via direct figurative images. For instance, where I work, we have computing-related pictures on the walls. In other situations, though, this is inadvisable (many hospital departments, for instance, would not want to use this approach for their particular speciality). This is where the much-maligned concept of the logo can be useful. If each ward has its own distinctive logo, then this can be incorporated into signage and into headed paper as a wayfinding aid. Like the previous article about external signage, this article is a first skim over a broad topic. It’s intended to give an idea of a general approach, rather than to be a detailed manual. This entry was posted in design, visualisation and tagged landmarks, navigation, nonverbal wayfinding, user centred design by hydeandrugg. Bookmark the permalink.